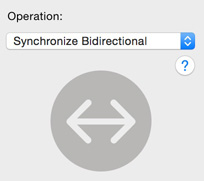 This guide explains the procedure for creating a ChronoSync synchronizer task to keep each of the following Home subfolders in sync between two Macs. 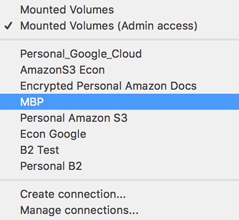 This guide is linked as part of the "Sync The Home Folder Between Macs Using ChronoSync" Guide but can be used stand-alone to setup a task to keep any one or more of the above folders in sync between two Macs. If you are syncing 'Pictures' then follow this Guide instead: "Syncing The Pictures, or Movies folders between two Macs"
If you are syncing 'Music', then follow this Guide instead: "Syncing The Music folder between two Macs"
Before running any sync for the first time, make sure to backup all data on each Mac in the event something goes wrong. Since home-to-home files syncs are usually bi-directional syncs (syncing files both directions), this is especially important. When running any sync, ChronoSync can archive any changed or deleted files, but it is a lot easier to restore files from a backup rather than restoring from the ChronoSync archive. ChronoSync, Time Machine, or any other backup application can be used to perform the backup of each Mac. Home folder syncs must only be done between identical versions of macOS. For example, do not attempt to sync between Sierra and High Sierra, and avoid syncing between different versions of the same OS (10.13.1 vs 10.13.2). Ensure all apps such as Photos, iTunes and Calendar are the same version, as well. Never attempt to sync files outside of the home folder such as 'Applications', 'System', or 'Library' between two Macs. Problems can arise if Applications or System files are synced that can easily result in application failure or a corrupt OS. In syncing two Macs, the focus needs to be on the home folder and the data files stored therein. Also, this guide assumes you already have ChronoSync installed on your primary Mac, and ChronoAgent installed on the Mac you will be syncing these folders to. If you don't already have this setup, just review the 'Setup Steps' in the "Sync The Home Folder Between Macs Using ChronoSync" Guide. Launch ChronoSync. Upon launch, the ChronoSync Organizer window is displayed. Choose 'Create a new synchronizer task' to create a new task. If the ChronoSync Organizer window isn't visible, choose 'File - > New -> Synchronizer' from the menubar or use the shortcut keys COMMAND-N. Give the task a meaningful name such as 'Sync Desktop Folder Between iMac and MBP' if this is going to be used to sync your desktop folder between the Macs. Choose 'Mounted Volumes (Admin access)' from the 'Connect to:' popup menu in the Left Target Pane. Since our example utilizes a connection to ChronoAgent running on another Mac, Admin Access grants ChronoSync the authority to update file ownership and group membership settings to match the user account on each of the two Macs. In this example, choose the Desktop folder for the Left Target by navigating to your home folder, selecting the 'Desktop' folder, and clicking 'Select'. You can also substitute the 'Public', 'Documents', or 'Downloads' for the chosen folder, if that is the desired folder. For the right target, click the 'Connect to:' popup menu and locate the name of the ChronoAgent Connection Profile you created when performing the 'Setup Steps' in the “Sync The Home Folder Between Macs Using ChronoSync” Guide. If you don't have your connection profile setup, then review the Setup Steps in the above guide to learn how to create the Connection Profile. In most cases, you will want deleted files from one target to also be deleted from the opposite target. To do this, turn ON the “Synchronize deletions” checkbox. When this option is turned ON, ChronoSync will delete files in the opposite target whenever it detects a deletion, keeping the two targets identical. Please note that no files will be deleted during the first synchronization because ChronoSync does not yet have a past history of what files exist. If you are following the “Sync The Home Folder Between Macs Using ChronoSync” Guide, then repeat the above Steps 1 through 8 to create a separate synchronizer task for each of the Desktop, Documents, Public, and Downloads folders you wish to keep in sync between the two macs, then return to Step 4 in the above-linked home folder sync document. 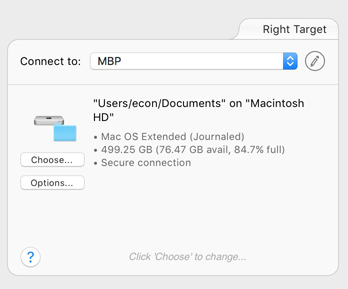 If you are using this Guide stand-alone to setup a synchronizer task to keep any one or more of the above folders in sync between two Macs, then continue here with Step 9. Once you have all the above-mentioned settings in place, perform the synchronization. This can be done by choosing the "Synchronize" icon in the toolbar of the task. Since you need to synchronize every time you switch Macs, it is not practical to schedule your Home to Home task container. Instead, you should manually run the sync every time you switch Macs to ensure the two Macs always stay in sync. Doing this will take some getting used to, but it's a habit that should be practiced. Always run every sync from the source Mac using the same task container.